There is misinformation, myths and distorted “facts” about OIT that circulates in the food allergy world. We put together a list of statements we repeatedly hear as reasons for not doing, pursuing or even learning about OIT. Yes, OIT is a medical treatment with risks. Yes, it does not work for everyone. However OIT works for the vast majority of patients with IGE-mediated food allergy in the hands of a skilled board-certified allergist. Start here to build some understanding, then sit down for a consult with an OIT allergist and get the best information available. Also check out our FAQs/ Q&A page, our OIT Community page, and visit our Research & Learn Library for 400 articles, medical journals and tv broadcasts about OIT. 3) OIT is not FDA-approved so it must not be safe. 4) It is common to have an anaphylactic reaction while doing OIT. 5) Most people have to drop out of OIT due to severe side effects. 6) If we skip an OIT dose or day, the allergy will come back, or we would need to completely start over. 7) We do not know the long-term effects of OIT and desensitization. 8) The leading food allergy researchers won’t endorse OIT as a treatment ready for private practice, so it must not be safe. 9) If OIT doesn’t work or you have to stop, the allergy might get worse, perhaps become airborne or contact reactive, or you might develop new allergies. 10) We could not do a 2-hour post-dose observation/no-exercise period with our lifestyle. My child is an athlete/active child. 11) Many / Most / A lot of OIT patients develop EoE (Eosinophilic Esophagitis) which is an allergic/immune condition with inflammation or swelling of the esophagus. 12) My child has multiple allergies; we could not do OIT for each of them and eat them all for a lifetime. 13) Everyone says we should only do OIT in a clinical trial. 14) We don’t want to do OIT because we hope our child will outgrow their allergies. 15) We do not want to do OIT because we heard children must take a food challenge before starting treatment. 16) My child is too anxious at the thought of ingesting their allergens with OIT. A) Everyone with real allergy has a severe allergy. There is no mild, moderate, or severe allergy. Reactions can be mild, moderate, or severe. But, there is no way to predict what kind of reaction one might have or what exposure level will trigger that reaction. Reactions are very unpredictable and variable. One reaction says little about what the next may be like. If you have a real allergy and a risk of anaphylaxis, then it is severe. Once that is established then we act like the military–we prepare for the worst, not the most likely. I don’t care what the numbers say or how high the levels are. The numbers show the likelihood of a reaction–they do not tell severity or predict the severity of a reaction. So, we prepare for the worst case scenario. Skin test result of IgE levels are pieces to the puzzle, NOT the whole puzzle. For OIT, there is not a level threshold where numbers are “too high” or “too severe”. Why? Allergies aren’t mild or severe–reactions are. One child can have full-blown anaphylaxis with an IGE of only 2.5, yet another child might just have hives with an IGE of 100. Numbers only predict the likelihood of “a” reaction but nothing about what that reaction might be like. 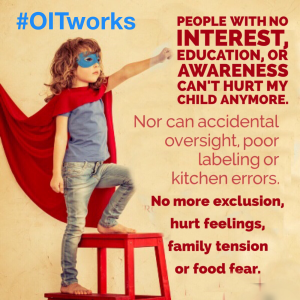 We have kids in OIT with very low IGE’s who have had very serious reactions before OIT. What DOES matter in OIT is finding the “threshold of tolerance”–the microscopic amount of allergen that can be consumed without reaction. It’s that simple. Threshold of tolerance for food allergic patients has been studied since the 1990’s. These allergists can make doses that tiny that patients do not react. Then the dose is raised and the immune and digestive systems adapt and the process is repeated. It’s like allergy shots where the threshold is raised slowly, and the allergen is invisible to the body. OIT is simply a written medical protocol using food. It requires a highly skilled, trained, board-certified allergist to administer it. Being prepared and able to handle an anaphylactic reaction is what allergists do. They do it daily in food challenges in office, where doses are thousands of times larger than OIT doses. 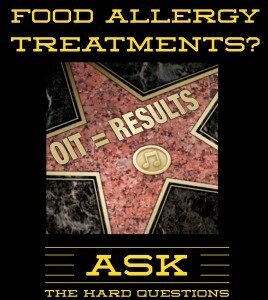 People do not want to do OIT because the AAAAI or ACAAI or FARE have not “approved” it and it is not in current food allergy treatment practice parameters. While these are well-respected organizations and people in charge of these groups, many who are in charge of these groups have been working with potentially very profitable pharmaceutical products that basically accomplish OIT or desensitization or other unproven “treatments” like Chinese Herbs. So, there is a double standard in their recommendations. 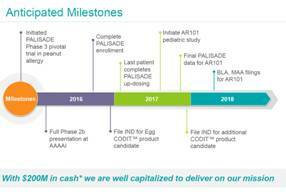 The stated goal for the FARE/Aimmune “OIT in a Kit” product is to get 70% of allergists to prescribe it and “with $200 million in cash we are well-capitalized to deliver on our mission,” which is to get this OIT product to reach $1.33 billion in sales (Reuters). 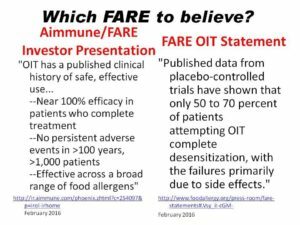 We will very shortly see FARE announce that they have “fixed” OIT through Aimmune’s product, when the reality is that they are recycling Dr. Burk’s OIT protocol from the Duke studies conducted from 2007-2009. There’s no magic to 3 mg of peanut protein. It was the same in 2007, as it is now. The 2018 “FDA-approved” version of 3 mg of peanut flour is simply the same 12% defatted peanut flour milled from lightly roasted peanuts from the Golden State Peanut Co (Alpharetta, GA) with added diluents, glidants, lubricants and filling agents. (Yum! And for $5500 per year for life, versus $50 a year for Planters peanuts). This particular product, Aimmune’s capsule full of peanut flour plus additives, really does not add to anything what is already available for OIT. It may be marketed like it does, but it really does not. 3 mg of peanut flour is 3 mg of peanut flour, regardless of whether it was in 2007, now, or in 2018. There’s no magic in that. No rabbit coming out of a hat, transformed after 10 years of waiting. 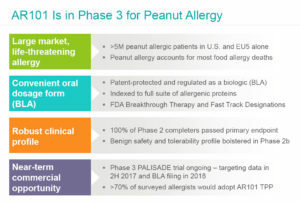 In fact, it makes little sense that one protocol was “picked” (versus tested and published) for this product, with a goal of creating “Standardized OIT” that is safe for every peanut-allergic person. We would expect a product for the masses /general population would use a LOWER and SLOWER protocol than the “Customized OIT” the current allergists do. However, this is not the case with Aimmune. For example, the starting dose, the first dose of a series given to the patient on Day 1 under “Standardized OIT in a Kit” is 250 times HIGHER than the average dose given to Private Practice patients. We know that giving a first dose of 0.5 mg will send some patients into an anaphylactic reaction. The typical starting dose for Practice Practice OIT patients is 0.002 mg, 250 times smaller. 2) allergists who have no background or training in OIT except what they may get from the manufacturer. There is a deeper issue than just what is or is not available, though. Pharma-driven products may indeed have a place with some patients given their circumstances in the realm of food allergy treatment. They may provide just another option for allergists at some point. However, when the physicians involved in these for-profit companies are also researchers at academic centers and, more importantly, occupying positions in national/international societies with influence over many–they have a conflict of interest. They do have a right to follow whatever path they want. But, those on committees that form “guidelines” should uphold a standard of being the voice of evidence-based medicine. Being involved in big-pharma products at the same time erodes the ability to maintain that objectivity. It does call into question the credibility of the recommendations from those individuals. We would hope there would be full-disclosure and conflicts of interest clearly shared. This also applies to FARE being open about being a major investor in Aimmune when they start promoting the product and FARE profits from it. Because on the one hand FARE bashes private practice OIT (so they can claim they have “fixed” OIT), yet on the other hand they are praising OIT to other investors in the Aimmune Corporate Presentation February 2016. Which FARE to believe? Patients need to be able to make more informed decisions on treatment options of a potentially life-threatening condition. We are not debating the Next-Great-Energy-Drink to hit the market. We are talking food allergy. A cynical person may feel that the research and academic physicians with strong influence over “national and international food allergy treatment guidelines”– withheld recommendations on OIT being done in clinical practice until their research was funded/completed or until their pharma-driven products were commercially available. 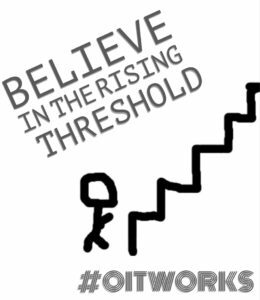 Many in the OIT community have grown cynical since 2010, but the reason for that is because that is exactly where the evidence points 🙂. Physicians and patients should have the ability to make the best decisions possible with the best information currently available given their circumstances–unbranded and honest. That will yield real progress. While these pharmaceutical products will help many food allergic patients, there is also a huge risk to public safety. Rather than learning and studying OIT at a deep and comprehensive level, anyone with an Rx pad will be simply follow the written instructions from Aimmune. “OIT in a Kit” has the potential to take treating a deadly food allergy right into the hands of medical professionals with no allergy training, licensing or board-certification. After treating patients for several years, Dr. Wasserman launched a small pilot study in Dallas focusing on quality of life for 31 food-allergic families who underwent OIT. He compared his findings to results from a separate survey of 352 patients who did not have OIT. The post-therapy group reported their quality of life to be about 10 times better. There are now multiple studies that confirm the enormous improvement of quality of life due to OIT. OIT is safe. Dr. Chad Mayer: “Most patients experience mild symptoms the first day of therapy (mild hives, oral itching/burning, GI discomfort). Severe reactions are rare occurring anywhere from <1%-10% (of patients) depending on the study. Most studies the rate of anaphylaxis is 5%. This reaction rate is for the total protocol not per dose. Approximately 85% of patients finish the protocol, the 15% drop out rate is primarily due to inability to continue to keep to the schedule, and GI discomfort. There have been a few patients (1-2%) diagnosed with Eosinophilic Esophagitis and had to be discontinued (unknown if the patients had EoE prior or was induced by ingesting the allergen– I suspect there has been both). Dr. Wasserman says that about 15% of his patients drop out of OIT for reasons including severe reactions; stomachaches or vomiting hours after dosing; an aversion to the foods to which they are allergic; and anxiety. Many of the OIT allergists cite success rates of 90%+ in their private practices. “Customized OIT” increases the odds of success and doses can be adjusted precisely to what the patients need, and time in between updosing can be extended to the patient. Dr. Mayer had one patient who took 7 months to get to the “typical” Day 1 dose. That would not be possible with a rigid “Standardized OIT” protocol in a kit. Not true. First of all, the allergy never “leaves” so it can’t come back. When you complete OIT you are desensitized, but still allergic. People worry about skipping a dose, but OIT doesn’t work like insulin where you need a certain amount to live or you die without it or suddenly need to start over. Nor is it like a cup that you fill and one drop over the top causes a reaction. 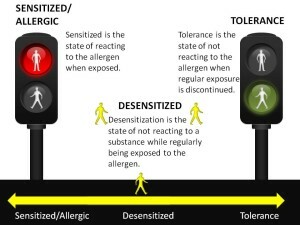 Instead desensitization saturates, occupies or blocks the IgE receptor sites that normally if triggered / activated by eating the allergen, would set off the anaphylactic allergic response. You need a certain amount to do this “saturation” and since they aren’t tolerant yet it needs to be replenished by eating it again and reminding the receptors it’s a friendly substance. 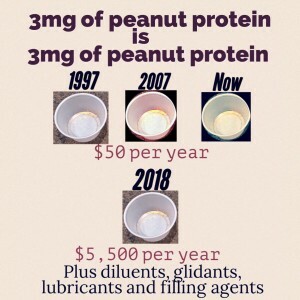 That amount is eventually between 5-10 peanuts but once those are saturated they can eat a lot more–we say people are “fully desensitized.” Hence the final peanut challenge of 2 or 3 times more than the daily dose amount to ensure that point of “full desensitization” has been reached. We see over and over that most problems occur with getting to one peanut or so, and then it’s easy to increase as the threshold rises. When an OIT patient eats the dose and the allergen doesn’t trigger a reaction they get the PROOF that it’s working. Daily. It’s a daily successful food challenge. There’s no question they are safe. It’s surreal to SEE your child do this daily. Liberating. Freeing. Everyone has a tiny dose at which they don’t react to the allergen. This has been scientifically studied for decades–even from 1997– to determine safe starting doses so there is NO REACTION. Then it just builds from there. 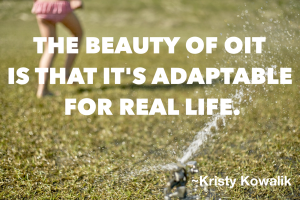 The body adapts. And once you hit a certain level, we say around 8 peanuts or a single daily serving of other allergens, you can eat unlimited. You simply don’t react. Note that the half that “failed” being able to eat unlimited peanuts after being off therapy for a month were still able to eat 10-12 peanuts with the majority being able to eat 12!!! Not one child in the study ate less than 10 peanuts after totally discontinuing peanut ingestion for a month. The half that were treatment “failures” resumed OIT. So half the kids started losing “full” desensitization after being off OIT for a month but still ate 10-12 peanuts. OIT has been studied for many years: the first journal article appeared in 1908. There are over 200 articles on OIT in our Research & Learn library, conducted worldwide, under many different conditions. There is no doubt OIT results in desensitization for the vast majority. Desensitization itself has been practiced by allergists since 1911 through allergy shots. Dr. Sugerman says, “The kind of desensitization that allergists have been doing for over 100 years, i.e., allergy shots, never underwent clinical trials. And that’s the way our specialty was born.” It goes even further back: “Desensitizing isn’t new to our world. Actually Alexander the Great used to do it. He would de-sensitize his body for poison before going out to battle,” Dr. Kari Nadeau of Stanford explains. Other forms of desensitization in wide use are for insects and venom, and drug desensitization to aspirin and life-saving antibiotics. Dr. Nadeau of Stanford has treated over 1000 patients with OIT, and has the longest-running study, following patients for 10 years. Several private practice offices have graduated hundreds of patients with success: Dr. Factor, Dr. Mendelsen and Dr. Lee over 800 patients, Dr. Baker over 500 patients, Dr. Wasserman, Dr. Silvers, Dr. Sugerman and Dr. Kamili over 300 patients. In a 5-year study, everyone could eat 10-12 peanuts after a month off completely stopping therapy. Children who were treated with oral immunotherapy for cows’ milk allergy showed long-term desensitisation seven years later. 4 year study: Egg OIT has lasting effects after stopping dosing. Long-term treatment with egg oral immunotherapy enhances sustained unresponsiveness that persists after cessation of therapy” —> 27.5% had sustained unresponsiveness after 2 years, and 50% after 4 years. 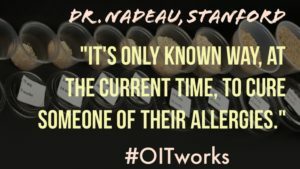 Dr. Sakina Bajowala answers: “I believe that OIT can be performed safely, but only under the supervision of a Board-Certified Allergist & Immunologist who has made a commitment to tailoring his/her practice to the treatment of food allergy. OIT is a labor-intensive procedure that requires a near-obsessive amount of attention to detail in order to minimize the risk of errors. 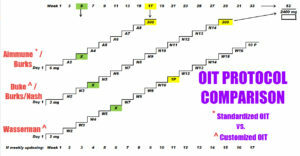 So, to a certain extent, I do agree with those who claim that OIT is “not ready for prime time”. Not every bread and butter allergy office is set up to properly provide the level of personalized attention that OIT requires. We do know that in qualified hands, and with the flexibility to customize protocols to the individual patient’s needs, OIT has 85-95% success rate in private practice. We know that with time on OIT maintenance, allergen-specific IgE values drop. We know that OIT can successfully reduce food allergy related anxiety and substantially improve not only safety, but also quality of life. What we are still trying to learn is how to identify those patients who are in the 5-15% of patients who are not able to tolerate OIT, whether it is due to unremitting gastrointestinal symptoms or recurrent systemic reactions. It also remains to be determined how long OIT maintenance dosing must be maintained consistently before patients can achieve “sustained unresponsiveness”, or the ability to retain tolerance to a previously allergenic food despite not consuming it regularly. Also to note, most of the “leading food allergy researchers” are engaged in financially profiting from food allergy treatments looking for FDA approval or sold as “Chinese herbal supplements” for thousands of dollars a year right into their private company pockets. Snack Safely explains it this way: “What is the incentive for these companies and others to develop therapies? 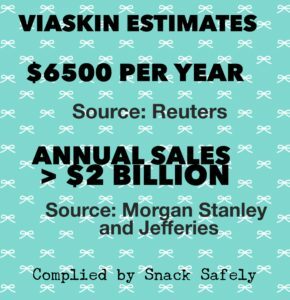 In a recent Reuters article, analysts estimated that a year’s supply of Viaskin will cost $6,500 and Aimmune’s treatment will cost $5,500. The article quotes Credit Suisse analyst Vamil Diwan estimating that (FARE’s Aimmune) AR101 could reach peak annual US sales of $1.33 billion, while analysts at Morgan Stanley and Jefferies estimate Viaskin (Patch) could reach potential for annual sales of greater than $2 billion.” Follow the money. Question: What are implications of stopping OIT (i.e., if you dropped out or were unable to finish)? Is there a possibility of making the allergy worse? One of the biggest “barriers” that keep people from OIT is the “Myth of the 2 Hour Rest Period.” We actually prefer the term “observation” period versus “rest”. The word “rest” implies tying them to the couch. We try not to use that word “rest period”; it has such a negative connotation. What kid would want a rest period? Naps went out in kindergarten. “Observation period” fits because we are keeping an eye on them. After each dose, there is a 1 hour parental watch period, followed by an additional hour of no exercise. The goal is to keep the core body temperature stable as the body is digesting and metabolizing the allergen. OIT offers a ton of flexibility in your life. 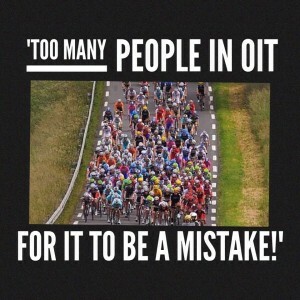 We fit OIT into our lives, not our lives into OIT. During the updosing period from 4-12 months there might have to be some choices and changes as a result of doing this medical treatment. However most of us find it easy to work dosing into our plans. The actual dosing is done in 1-5 minutes; it’s eating a food. It can be done anywhere. The post-dose guidelines we see from parents and physicians are “normal” activity–walking and moving around is fine. It’s more about not raising core body temp than heart rate. So racing up flights of stairs, wrestling, or bike riding might not be great ideas. There are tons of “normal” things that are fine–homework, games, TV/computer, crafts, cooking, reading, carpooling, and even walking to school. 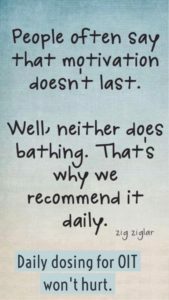 If you focus on the “nots” like running or biking and reframe it as “Just don’t run!” you realize it’s a large part of the day that can fall into the 2 hour zone. Some parents have even bought Fitbit-type monitors so the kids can police themselves about heart rate and activity level. In maintenance and even during updosing, many simply eat their dose one hour before bed. That’s quiet time anyway. Or some dose an hour before school starts, knowing that an observant teacher is watching for the second hour. Especially at the beginning, their bodies are working HARD to metabolize and digest the peanut. This is simply a suggested precaution. What one OIT allergist has said about the no-exercise rule is that we just don’t know who needs it and who doesn’t. Many don’t, but short of dosing and putting kids on treadmills to test them exercising vigorously there is no way to know. And even with that method, there is no way to know when that might change based on illness or hormones. So it’s a flexible precaution developed because some kids have had issues. As parents we just picture their internal engines working hard and give the body the respect it deserves! You have to realize that exercise-induced anaphylaxis with food allergies is a REAL thing and not understood well, so even without OIT it could occur. Some doctors believe in more strict control, others are more relaxed about it. Some are strict through updosing and relax or get rid of the no-exercise precaution in maintenance. It’s an area we don’t know the answer on. The topic is an in-depth discussion to have with your doctor to assess your child’s actual risk level and what you are comfortable with. “Informed consent” in partnership with our allergist where we make the best choice for our family. Other factors can increase eosinophils, like reflux according to APFED: “Diseases other than EoE can cause eosinophils in the esophagus including gastroesophageal reflux diseases (GERD), food allergy, and inflammatory bowel disease.” According to APFED: “People with EoE commonly have other allergic diseases such as rhinitis, asthma, and/or eczema.” More males than females are affected with EoE. Dr. Chad Mayer: “Food allergy can lead to EoE. So if you are a person with EoE and you eat what you are allergic to, you can become symptomatic.” In other words, anyone with a food allergy is at risk of EoE. There are also people without food allergies who have EoE. There is a risk of EoE with OIT. This study (of 15 studies) published in the US National Library of Medicine National Institutes of Health says “The overall prevalence of EoE after OIT was 2.7%” and that “EoE often resolved after OIT discontinuation.” In other words, discontinuing OIT often resolves EoE. Multi-allergen OIT (mOIT) is on the horizon and many of the allergists are implementing it in their practices. Some group certain foods together like milk and egg, others do multiple tree nuts together for example, and others allow “up to 3” or “up to 5” to be combined at once. We have patients in our OIT Facebook support groups who have desensitized 20+ food allergens through OIT. Some alternate the foods throughout the week or stay at a lower dose to provide “bite proof” protection (from accidental ingestion) and a lower quantity of food to be eaten regularly in maintenance. Use of the drug Xolair is being studied to allow multiple foods to be more easily combined in mOIT therapy. While Xolair has some risks of its own, studies appear promising for people with multiple food allergies to be able to desensitize to more allergens at once. As for a lifetime? There is less evidence on long term tolerance (basically is this a cure?). Studies are still ongoing on if therapy will induce long term tolerance where daily doses will no longer need to be given. We know from a number of studies that after a period of time (studies have varied this length of therapy) that daily dosing can be discontinued and for a month or two the patient remained desensitized. All of these trials then put the patient back onto daily dosing schedule. When will you be able to stop the daily dosing at home? That question cannot be answered at this time. It will be for at least 3-5 years, and most likely longer or a lifetime for some patients. The standard advice food allergy families get, “Only do OIT in a clinical trial” doesn’t make sense. The actual desensitization process between private practice and trials is similar: home dosing is 93% of it and supervised updoses 7% of the time with an allergist and staff member trained to handle any reactions that occur. Being prepared and able to handle an anaphylactic reaction is what allergists do. They do it daily in food challenges in office, where doses are thousands of times larger than OIT doses. Several of the OIT doctors actually started their careers in research and came out into private practice. Many have associated Clinical Research businesses in addition to their private practice and conduct research in multiple areas of allergy and immunology. OIT has been done in private practice for nearly a decade. There are 70+ doctors in 2016 offering OIT in their offices. All the OIT allergists are board-certified allergists with full practices. 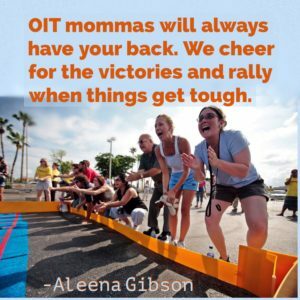 For almost all, OIT is just a small part of their overall practice. 84% of OIT patients have insurance coverage for their treatment. As for doing OIT only in clinical trials, there are a number of advantages to doing OIT in the office of a board-certified allergist. OIT is different than most therapies being studied–usually to “get” the treatment or medicine the only way is to enroll in a trial or study. Here you can call a private doctor who specializes in OIT and perhaps start this month and go at your own pace, with “customized” OIT based on your threshold. We find that 84% of patients have had insurance coverage in the last 2 years, up from only 43%> 2 years ago. Researchers typically don’t get funding to keep studying the same thing, so the OIT studies usually have a twist or mission or specific research question other than “does it work?” So there are very specific criteria to “qualify” for a study, and often long waiting lists. Often in food allergy trials if you end up in the placebo leg, at the end (months or years) they allow you to switch into the active leg. You do get treated eventually, and that’s the “carrot” that they have to offer. But you can spend months or a year getting no treatment if you are in the control leg. For people who can’t afford private practice or don’t have insurance coverage, trials are a GREAT option. Or if you didn’t have an OIT doctor nearby and only a trial then it makes sense to jump at it. Or if a trial meets YOUR specialized need better like on a 12-month old child or for multiple allergens at once. While trials have some flexibility built in, by nature they are set in stone for dosing and timing to maintain uniformity for data collection. If you look in our Facebook OIT support groups at any given time you’ll see posts of people who needed adjustments to dose or timing, which is what a private doctor can get you. Want to take a month off from updosing due to sickness or vacation? Back down on a dose for tummy troubles and hold for a month, or two? No problem in private practice. You can do that a bit in trials but not too much, they have clear benchmarks participants must meet or be removed from the study. People obviously do “fail out” of trials where it would be a mutual choice to stop OIT treatment with a private doctor. When you try and updose to a set schedule it doesn’t always work. We had one mom in our Facebook support group whose child threw up daily for 5 weeks straight trying to meet the clinical trial requirements to get to 300 mg by a certain date. That wouldn’t happen with your own doctor; your pace and dose would have been slowed down at the first sign of trouble. Clinical trials absolutely have more monitoring and bloodwork requirements because they need it as a benchmark. Blood, skin and a food challenge at the beginning and end of treatment, and sometimes throughout. Trials also always require an oral food challenge before you start because they need the benchmark to measure progress. In private practice the only thing that matters is tolerating the dose and the initial doses are already determined in the protocol, and chosen through science with highs odds there will NOT be a reaction. 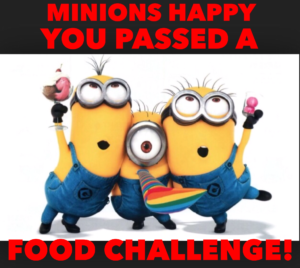 It’s the opposite of a required food challenge in a clinical trial. One last consideration is important–what is the long term care plan? We are with our OIT doctors for life. They are constantly studying OIT and sharing with each other what works. What happens when the trial is over? 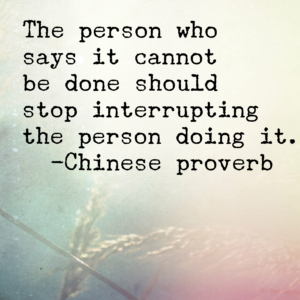 Often the researchers are researchers and go on to do something else when the trial is over. Yes, they may still be available to you, but are they dedicated to treating lots of patients with OIT and developing expertise? That is an excellent reason to delay OIT! No allergist wants a child to do a lifelong treatment if they do not have to. This is another, less-cited reason for doctors preferring to wait to do OIT until the child is 4 or 5 years old and trends can be accurately tracked and evaluated. Only 26.6% of the children in the study outgrew their allergies, at an average age of 5.4 years old. Incorrect. When doing OIT with a board-certified allergist in their private practice office there is no food challenge required to start treatment. That is different than an OIT clinical trial. Trials and studies also always require an oral food challenge before you start. The goal is to elicit a measurable reaction because they need the benchmark to measure progress after treatment. Starting OIT in private practice is the opposite: we do not want or need to get a reaction; in fact the goal is NOT to have a reaction. In private practice the only thing that matters is tolerating the dose and the initial doses are already determined in the protocol, and chosen through science with high odds there will NOT be a reaction. It’s the opposite outcome: the dose is invisible to the body and there is no reaction. Starting OIT doses have been studied since the late 1990’s to determine safe, non-reaction levels. The dosing escalation protocols typically don’t shift patient to patient–they are often uniform. Because for the vast majority the established doses work since they are lower than the patient’s “threshold”. However, the allergist can quite easily customize the dose to the patient and their unique threshold. They start with doses that are hundreds of times smaller than what they think can be tolerated by the end of Day 1. So why would a private practice OIT doctor deviate from that and do a food challenge before OIT? Well first, no doctor wants a child to do lifelong OIT if it is a false positive or a child is outgrowing on their own. This is where the reaction and patient history and all historical lab values are factored in with the doctor’s experience. Sometimes a challenge is given with the high expectation the patient will pass it. So it’s not a challenge to find a starting dose–but to avoid OIT and be FREE from a food allergy. Sometimes, the doctor might suspect a higher threshold and offer a challenge in order to start at a higher dose. This doesn’t happen a lot, but it can happen. Why start at 2 mg if you could tolerate 50mg? That’s an individual choice–informed consent–between a doctor and patient. 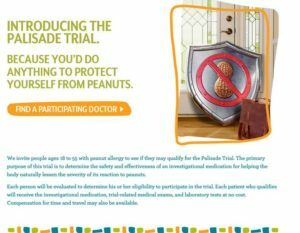 There is also an optional “final challenge” at the end of treatment for patients who become “fully desensitized”, essentially to a full serving of the allergen. The final challenge is given that is 2 or 3 times higher than that daily dose. This PROVES the patient is fully desensitized, and in theory could eat unlimited amounts of the allergen. Parents need to understand the science behind it and how OIT works. 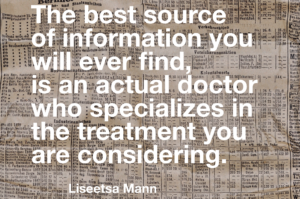 Luckily there are hundreds of articles and clinical studies to read, and videos to watch. It’s actually overwhelming how much is available. 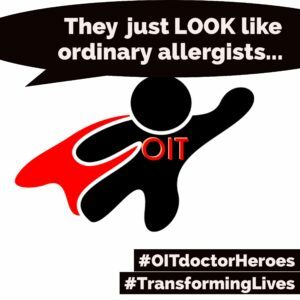 We see that those who choose OIT are those experiencing “pain” of some sort: whether it’s exclusion/missing out, tired of being different, anxiety over food, family issues, or having terrifying anaphylactic reactions. The “payoff” becomes so attractive that doing the work and taking the risk that OIT won’t work becomes an attractive option. It’s the famous “pleasure/pain principle”. So, for a kid who doesn’t want to do OIT look at their “pain.” If the FA life isn’t causing he them any–why is that? It may just be a laid-back kid who takes it in stride. What we see more of is that it’s the PARENTS who have all the stress and work really hard to protect their kids from feeling different (and make ourselves crazy in the process). Which is awesome if you don’t want to pursue treatment. But if you want to do treatment, perhaps your child isn’t feeling “pain” so there is no discomfort and no payoff that they can see. Younger kids are still pretty confident and can feel totally safe because YOU are going nuts to accommodate them. So if you want your child to experience “real life”, then focus on not overcompensating for the allergy. Safe yes, but perhaps not always included or accommodated as much as you have been. Because it’s these kids, who never have reactions and aren’t excluded from anything because Mom is there to make it ok, these are the kids who feel invincible as teens. There’s no “pain” from the allergy so they start sneaking food and not carrying Epi. And we read their tragic stories in the news. For older kids and teens, along with the above, you make doing OIT their choice. They MUST buy in. It’s their life and their body. But understand their valid fear and total ignorance of how this works. What has worked well for parents is to assure them “IF AND WHEN” is their choice. But, here’s the catch: they must explore OIT and learn about it. Sort of like a science project. This is a life skill you can give them about how to manage their health and make tough decisions. Require them to learn the science behind OIT. How it works. Thresholds of tolerance. Read the articles and studies. Watch the other kids’ videos and postings. Then develop a list of questions, fears and concerns and go for a consult with an OIT doctor. They are used to terror. Then, after they complete all this, your child can make the INFORMED DECISION if they want to do OIT or not. We have seen this work time and time again. It’s parenting and empowering at its finest, to teach them to research and ask questions of a doctor. OIT won’t be the right choice for every family. However, it is a completely normal response to start, for a child to say “no way.” We guess that 98% of the kids who have done OIT weren’t at all excited by the prospect of eating their allergen. But it is our job as the adult/parent to provide information, counseling (which many kids need because of their food allergies), and ultimately to make the choice in care for our children. If your child needed a new kidney but was afraid of surgery no one would say, “I like to let them decide.” This is equally life saving, but clearly a choice that each family makes for themselves. 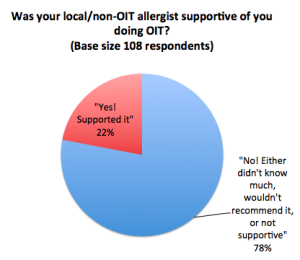 78% of OIT parents did not get support or correct knowledge from their local allergist. They had to get correct information from an OIT allergist to make the choice to do OIT. Most doctors who advise parents to choose “Strict Avoidance” don’t fully grasp how contaminated our food system is. Every week we see on Facebook support groups, “My child had a reaction and I only fed them safe food.” Allergists don’t see the reality of 200,000 ER visits and millions more that don’t go to the ER each year. So OIT “looks” riskier because they think the odds of anaphylaxis are near zero with “Strict Avoidance.” If it really was, if we really could keep them safe easily without treating them we would certainly do that. Those of us who have done OIT don’t believe strict avoidance was a good strategy for us. 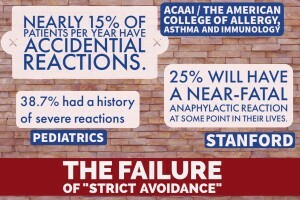 The simple fact is that “Strict Avoidance” is an epic fail. The numbers are staggering with 200,000 ER visits, 200 deaths and millions of reactions that don’t go to the ER every year. Millions. Without OIT, The American College of Allergy, Asthma and Immunology (ACAAI) says nearly 15% of patients per year have accidental reactions. Stanford says approximately 25% will have a near-fatal anaphylactic reaction at some point in their lives. Among children with food allergy, 38.7% had a history of severe reactions according to Pediatrics journal. Those are REAL odds, and in addition you have to live on hyperalert, deal with exclusion and social/family/school stress and food fear. And truthfully, most doctors can’t have insight to the in fear, exclusion and stress parents of food allergic children grapple with. The always-on-edge worry. Every bite of food we watch them eat. Our children’s faces when they are left out once again. We know it’s just not that easy. You have to compare the risks and benefits of BOTH choices. Strict Avoidance vs. OIT. Talk to an allergist who does OIT. . . Listening to scare tactics or misinformation from our doctors happened to 78% of us in OIT. We found new doctors who are actually doing it and know what they are doing. That’s what people get second and third opinions, especially from doctors who have success in doing specialized treatments that require special training. Getting a surgical opinion from a non-surgeon doesn’t make sense, does it? Now Click on the map and find an OIT allergist near you!